It’s the beginning of the end for the Harry Potter franchise, and you can definitely feel it. Before we get too far into this, I should caution readers that, unlike apparently 90% of the moviegoing audience, I don’t read the books. I know, I know — “blasphemer!” — but actually I think I’m much ahead of the game in this regard. Well yes. It’s a film, not a book. Ask any Lord of the Rings fan about what was left out of the Peter Jackson trilogy, and plan to be occupied with the resulting details for at least as long as the running time of one of those movies. Compounding the problem is the fact that the audience want their magical cake, and to eat it too: they want loads of details (particularly the most important ones), which would normally force filmmakers to stretch out the franchise as they have opted to do with the finale; but they also want the kids to look at least something like the ages of the characters they are portraying. HP fans are seemingly unaware of how much effort and how long a special-effects-heavy epic like each of the HP films take to produce — the child actors are already considerably ahead of their characters’ ages. Harry was 11 years old in the first film, which means he should be 16 in The Half-Blood Prince. Daniel Radcliffe is as I write this about to turn 20 (he and I share a birthday, as it happens! ), and the other leads are similarly aging well beyond their alter-egos. Had Warner Brothers opted to make two films each for each book beyond the third, it would have required re-casting the lead roles by the fifth book’s adaption. So all the moaning about how much of this book is missing is falling on deaf ears with me, in part because (not having read it) I don’t know what I’m missing, and in part because I understand (apparently much better than HP fans) how films are made, and usually (but not always) trust the production team to have a good sense of what parts are the most “filmic” and what wasn’t, given their limitations. This can involve re-arranging events, jettisoning some storylines or even inventing new action to “bridge” between the remaining elements most efficiently. Peter Jackson in particular did a damn fine job of this balancing act in his LotR films, I thought (and yes, I had read the books beforehand for that one! ), but Harry Potter and the Half Blood Prince is hardly the first book adaptation to change dramatically (pardon the pun) from page to screen. Purists need to get over themselves a bit, methinks. Not reading the books frees me considerably to enjoy (or not) each film as a film, and to be surprised or shocked or whatever Rowling (plus the film creators) intended. I’m also pleased to know that when (or if) I choose to read the books, a wealth of additional layering, detail and general imagination await me. Given the obvious emotional attachment the books engender in their readers (and the consequent strong mixed feelings this film more than the others is engendering in its audience), even if I’d read the books back when they came out I’d have made a strong effort to forget the finer points and just enjoy the ride of this film as a related but not necessarily faithful endeavour. So, finally, to the point: given my particular perspective, did I think it was good? The answer is yes, quite emphatically. Indeed, I have to say I enjoyed this one more than at least the last three outings (which, as films, were mostly convoluted messes, particularly Order of the Phoenix). On most occasions beyond the first film, the makers chose to try and cram as much of the books as possible into an impossibly tight timeframe, resulting in half-developed plotlines, rapid-fire editing, intros and outros of myriad characters without any reason to pay attention or care about them, jibberish passing for plot exposition (usually relayed breathlessly) and good old confusion abounding. That’s not to say there wasn’t plenty to like in the recent films; I enjoyed most of Goblet of Fire, only being annoyed by the introduction of a new, bland character who’s only (and obvious) job was to get killed off at the end (Cedric Diggory) and the poorly-edited and badly-rushed Quiddich World Cup sequence that starts off the movie, which prompts questions from non-readers like me such as “if they’ve had Floo Powder all along, why on earth are they using a train to get to Hogwart’s?” to which readers roll their eyes, sigh in an exasperated manner and attempt to relate all the additional detail in the book that smoothes over this obvious plot hole. Likewise, Prisoner of Azkaban and Order of the Phoenix in particular are (in my opinion) almost unwatchable god-awful mish-mashes of incoherent plotting and superficial vehicles seemingly made primarily to trot out yet more dead-end characters and give employment to nearly every A-list British actor on Earth, despite usually good performances from the array of regular and guest stars and (at least since the fourth film) decent direction. In both movies, there is so much hinting at so much more going on, every line dripping with forced attempts to make it say all the dialogue that wasn’t there. The tantalizingly strong auxiliary characters (like Gilderoy Lockhart, Cornelius Fudge and “Mad-Eye” Moody among many others) and the bewildering locations and elements are often wasted in a hodge-podge of editing that tries desperately to keep the film together but fails for the most part, even loaded as each film is with beautiful sequences, good-looking casting and Rowling’s own (and very charming) sense of the ritual of growing up. For The Half-Blood Prince, someone somewhere (presumably director David Yates) finally put their foot down and did the right thing: cut the book unmercifully in the name of making an actual, workable, coherent, enjoyable adventure film. From my perspective, they succeeded at last, and one can only hope that they will use the extra “breathing room” the stretched-out finale will give them to do more of the same: treat the novels as a guideline, not the script itself, and craft a meaningful film instead of a picture-postcard of the most visual moments from the story. That’s not to say it was flawless: quite a number of characters seen in previous films get pretty short shrift in this one, some to the point where I have to wonder why they were included at all. Hagrid (Robbie Coltrane) in particular serves no real function in the story, except to lose yet another pet (which, again from my perspective, is about all this guy ever does!) 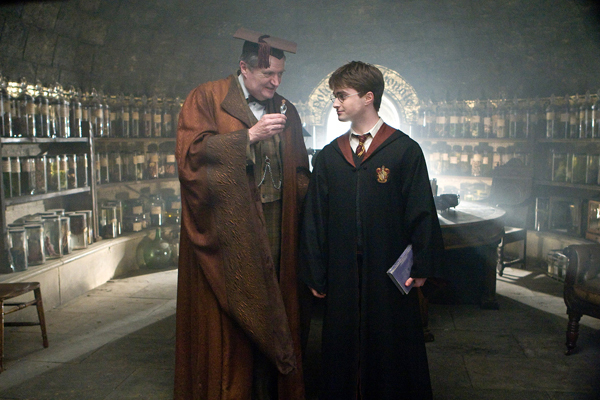 and provide a locale for Slughorn’s big moment (which really could have happened anywhere, and indeed the convoluted way Potter gets Slughorn to Hagrid’s hut is one of the only really off-key notes in the movie). Other characters so important in the plots of previous films are given barely-even-cameos in this one (for example, Neville Longbottom or Argus Filch and so on), reminding us that they’re still there, but leaving us wondering why nothing significant seems to happen to them anymore. Even most of the professors are reduced to a single line or two, even ones (like Maggie Smith’s Professor McGonnagal) who seem to be important to the plot of the book, but just seem like drop-ins in the film. There’s not much point in recapping the plot here as most film reviews usually do; everyone reading this likely has a deeper understanding of the story than I do. But this time, I was easily able to follow the sequence of events without feeling like a girl outside the Boy’s Private Clubhouse, and very much enjoyed the more relaxed pace of the film. This allowed me to take note of the evolving acting of the three leads, the truth (very well) infused into the scenes of the kids coming to grips with getting older and raging hormones, and the general affection the characters have for each other as well as that the actors have for their alter-egos. I remember well my own growing-up years (where I looked and acted not all that unlike Ron Weasley) with much affection and it’s obvious JK does as well; her handling particularly of the complexities of teen girls is very on-the-mark, but she gets the male chemistry just right as well. It was smart to explore this more fully than the way similar feelings and depth got butchered in Goblet of Fire. Jim Broadbent, without question one of Britain’s greatest actors ever, steals every scene he’s in as retired Professor Slughorn, called back into service by Dumbledore (who gets some much-needed fleshing-out in this one) as part of an elaborate scheme to undermine Lord Voldemort’s plans and prepare Harry for what is to come. Broadbent has to play his character in two time periods separated by 40-50 years time, and pulls it off not just convincingly but marvellously. Ironically, Broadbent’s performance is so high-calibre that it has the unintentional effect of making Alan Rickman’s Snape look utterly ridiculous in all but his most menacing moments. One line particularly well drolled-over by Snape got cascades of laughter from the audience, the opposite of what was seemingly intended. Tom Felton as Draco Malfoy finally comes into his own in this film, which is as much about him as it is about Dumbledore. His climatic scene shows at last all the ability and complexity that Felton has had to keep well under wraps as the previously-cartoonish Malfoy. Likewise Evanna Lynch’s Luna Lovegood (happily returned from the previous film) gets to be a bit more than just a refugee from Twin Peaks as well. We also have time to see how Fred and George Weasley are getting on with their joke shop, something I would have thought would be cut for more “important” scenes, but give the film a nod of homage to Charlie and the Chocolate Factory and generally add some much-needed levity to the increasingly-darker series. Kudos of the opposite kind must also go to Hero Fiennes-Tiffin, who plays his uncle Ralph Fiennes’ character Voldemort/Tom Riddle as a young boy straight out of The Shining. The resemblance works well and the kid is appropriately creepy. Sadly, some characters go the opposite route, getting more cartoonish. Rickman’s Snape has already been mentioned, but Helena Bonham Carter is completely wasted in this film as a cackling, half-mad imbecile, and even all the members of the Order of the Phoenix descend into poor caricatures of themselves. Add to this the number of seemingly-gratuitous cameos of Hogwarts regulars and the shallow interpretations of red herrings like the Dean Thomas character (not to mention the forced-feeling injection of more minorities, albeit still in utterly inconsequential parts), and you get a small army of add-ons that actually detract from the good work done by the main cast. Whether this is a crime to lay at the feet of the writer, the director or the editor I can’t say, but even as someone who doesn’t know the deeper meaning/destiny/importance of these characters, I can see that they cry out to either be expanded upon or discarded. Harry Potter and the Half-Blood Prince is, I’m pleased to say, worth your money. It’s the first film in quite a while for this series to mostly work well on all levels, and I shouldn’t forget to mention the very strong cinematography, art direction and music which added greatly to my enjoyment. If possible, try to forget the book and give this movie a try on its own merits. You may not love it as much as the muggle devotees, but at least you’ll understand why it has such broad appeal — indeed, this “chapter” of the saga is best compared to The Empire Strikes Back in terms of where (and how) the story has developed (a connection I’m not sure most Potter fans are old enough to make!). Now this is a clever idea, and really the way it should be done. BoxOfficeMojo.com has crunched the numbers and given us the real skinny: Gone With the Wind is still the all-time-so-far* box office champion. Anyway, the list holds several nice surprises, as well as vastly increases the diversity and timeline of the films that have ascended to the top. Not all of the top films are great classics, but many of them certainly struck a chord with their audiences and the ones at the top are, without exception, the kind of movies that people watch more than once, often routinely. One of the biggest surprises in the list is that (when you adjust for inflation) the very top film, the aforementioned GWTW, “only” did $1.5B (all figures US$). This suggests that it might be possible for a film to top this someday (as the totals allow for re-releases), as the worldwide market continues to grow. You have to expect the Lord of the Rings films to move up the charts a bit when the inevitable re-release happens, and I wouldn’t be surprised if the Harry Potter movies are re-released one more time just before the final film unspools. I was disappointed to see that E.T. did as well as it did. It’s almost certainly just me, but I have never liked the film, thought it very schmaltzy and better-suited to TV at the time, and the re-release and re-edit/re-visionism was just … an abomination. Even worse than the “Han Shot First” revisionism of the Star Wars re-releases. The fact that the totals allow for re-releases is the main reason why Disney movies are so well-represented here. Snow White has made many times more money in re-release than it ever did originally. The highest-grossing movie of which I cannot find reference to any sort of theatrical re-release was 1956’s The Ten Commandments, which scored the #5 slot. I was quite shocked to see that The Rocky Horror Picture Show limped in at a mere #70, a rating that can only mean that midnight screenings don’t count with the compilers of this list as a “theatrical re-release,” because I assure you that film has made way more than (just under) $400M. Heck, I am myself alone probably responsible for 1% of that (I’ve seen that movie many times, though I’m now fairly retired from watching it). I would be interested to see an adjusted-for-inflation version of the worldwide gross boxoffice chart, rather than just domestic US, but this is a good start that will hopefully inspire a few people to check out some “old” movies. Speaking of old movies, I note with interest that the all-time-so-far top-grossing B&W movie is the 1945 Bing Crosby film The Bells of St. Mary’s (#49). Other B&W films that made the list are The Best Years of Our Lives (1946, #72) and Sergeant York (1941, #95). I was kinda hoping that 1974’s Young Frankenstein would have made the list, but no such luck. Hollywood plans to make a movie of the videogame “Asteroids.”I think that’s it, we can officially now say that they have hit bottom. EDIT: I knew when I wrote that I’d be eating my words, but I didn’t think it would only take a day. A movie based on ViewMaster. Oy vey.